The Dai, Mazoon and Mukasir represent the Imam during his seclusion. The Mazoon is ‘Mazoon al-Mutlaq’ (regardless of Nass). The absolute raza given to him is part and parcel of the lofty position he occupies. Such raza is only given to one whom the Imam and his Dai trust implicitly. The Imam’s barakaat ecompass the 3 rutbas. The Imam’s Dawat is present through the presence of three rank-holders: Dai-l-mutlaq (Dai with full authority), Mazoon mutlaq (Mazoon with full authority), and Mazoon Mahsoor (Mazoon with limited authority, also known as the Mukasir, or Breaker of False Arguments). As for the Babs, Hujjats, and Duat al-balaagh, they remain with the Imam behind the curtain of concealment. (after some lines, Maulana Ja’far continues thus): Therefore, the Imam, peace upon him, is said to be present through the presence of these hudood. It is known that God Most High could not be comprehended by any one of His creatures, that no one could speak with him, with good or bad, benefit or harm, were it not for the presence of the Prophet, Wasi, and Imam to guide and direct them; God, may He be praised, is manifest and present through those hudood [Prophet, Wasi, and Imam]. In the same manner, the Imam, peace upon him, is manifest and present through these hudood [Dai, Mazoon, and Mukasir]. 1. This bayaan indicates the exalted status of the Mazoon, by stating that he is the second of the three rutba-na-sahebo (Dai, Mazoon and Mukasir), through whom the Imam’s Dawat is present during satr, and through whom the Imam himself is present. 2. It also indicates the Mazoon’s exalted position by stating that that the Mazoon’s full title is “Mazoon Mutlaq,” which means “Mazoon with full raza and authority.” All raza to carry out Dawat affairs are vested in him as part of the rutba. 3. It also indicates the Mazoon’s exalted position by stating that he is the second of the three rutba-na-sahebo (Dai, Mazoon and Mukasir). 4. It also indicates the Mazoon’s exalted position by stating that he is the second of the three rutba-na-sahebo (Dai, Mazoon and Mukasir) who are continuously aided by Allah Taala’s light. 5. 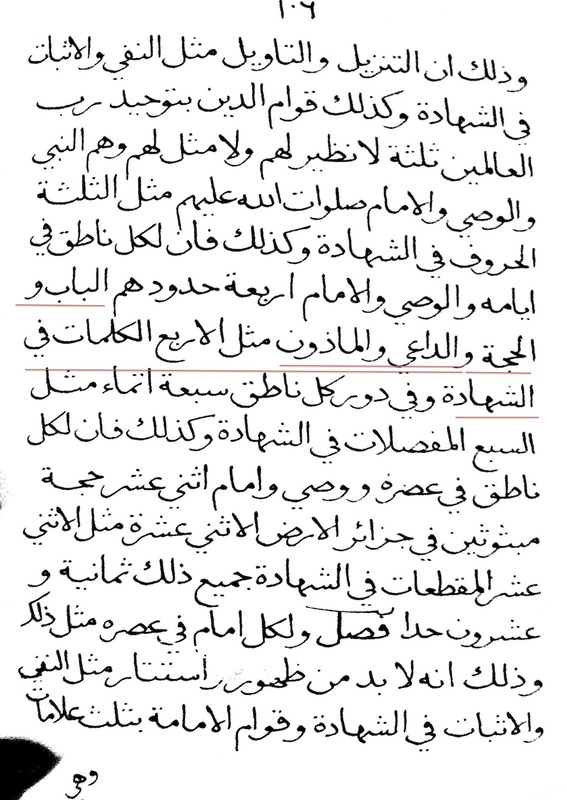 The author of this text is Maulana Ja’far bin Mansur al-Yaman was Mu’izz Imam’s Bab-ul-abwaab, the highest rutba after the Imam, and one who is ma’soom. 6. This bayaan is the source of the text in the misaaq, about the three rutbas. Section on the Quran’s injunction to obey God, Rasulullah and Imams, and similarly in Satr-na-zamaan to Dai, Mazoon and Mukasir. Obedience to Dai, Mazoon, Mukasir in satr = obedience to Allah, Rasulullah and the Imams. O soul, beware lest you squander the teachings of your lord. Listen to me, for I counsel you in the path of God and His Messenger. Be conscious of God and practice taqwa when you are alone, just as you do in public. Declare His oneness, and refrain from describing Him in any way, by speech or by thought. Cleave to your Imam-uz-zamaan, who is present through the presence of his Dai l-Mutlaq (Dai, who has full authority), Mazoon Mutlaq (Mazoon, who has full authority), and Mukasir Mahsoor (Mukasir, who has restricted authority). Obey them in whatever they command, for obedience to them is equivalent to obeying God, His Messenger and the Imams, and this obedience is mandatory (farizat). Answer their call, love and cling to them, and disassociate (bara’at) from their enemies. This bayaan equates obedience to Dai, Mazoon and Mukasir in the satr period with obedience to God, Rasulullah and the Imams; as per the mandate of the Quran requiring obedience to 3, who are all connected. It indicates the exalted position of the Mazoon in Allah Taala’s Dawat-ul-Haqq, depicting him as the second of the three hudood (Dai, Mazoon, Mukasir) through whom the Imam-uz-zamaan is present in the period of satr. It also indicates that he has full authority and raza in Dawat, by virtue of his rutba, which is fully transcribed here as Mazoon Mutlaq (Mazoon, who has full authority). It also indicates that obedience to the Mazoon is waajib, along with obedience to the Dai. It also states that it is waajib upon mumineen to love the Dai, Mazoon and Mukasir, and disassociate (bara’at) from their enemies. The Dai and Mazoon are paired Hudood – just as the Nabiyy and Wasiyy and Imam and Hujjat. The Kitab Da’a’im-ul-Islam discusses the washing and wiping with water (mas’ah) of the two feet; it states that mas’ah upon the two feet is a mandatory part of the wudu’. It is upon the two feet that your body stands, and they bear its weight and carry it from place to place. [Like the two hands], the two feet denote in tawil the Imam and the Hujjat, who bear the whole weight of their age and carry its people forth according to their stations, directing them in the affairs of religion to where they themselves are headed. This description further applies to all the hudood pairs (hudood muzdawijja), up to the Dai and the Mazoon. Each of these hudood bears the burden of the affairs of the people of the world, according to Allah Taala’s charge upon him, and directs them for Dawat affairs, based on Allah taala’s permission (raza). The tawil of mas’ah upon the two feet is professing belief (iqraar) in the Imam and Hujjat, and in all the paired hudood below them, along with awareness of what is due to them. It also indicates that Dai-Mazoon is an intrinsically connected pair, “hudood muzdawija,” like the Imam-Hujjat pair. It also indicates that just as iqraar and ma’rifat are waajib upon mumineen for the Dai, iqraar and ma’rifat are also waajib upon mumineen for the Mazoon. It also indicates that along with the Dai and his Mazoon bear the weight of the zamaan or age and carry its people forth according to their stations, directing them in the affairs of religion. As such, it also depicts the Mazoon as essential to Allah taala’s Dawat-ul-haqq, and an integral link in the chain of Allah taala’s hudood. … Imam Ja’far-ul-SadiqSA said: “Mumineen are brothers, born of the same mother and father. Their father is light (noor) and their mother is mercy (rahmat).” This is the explanation of his bayaan: By noor, he meant the Prophet SA, and by mercy, the Wasi SA. 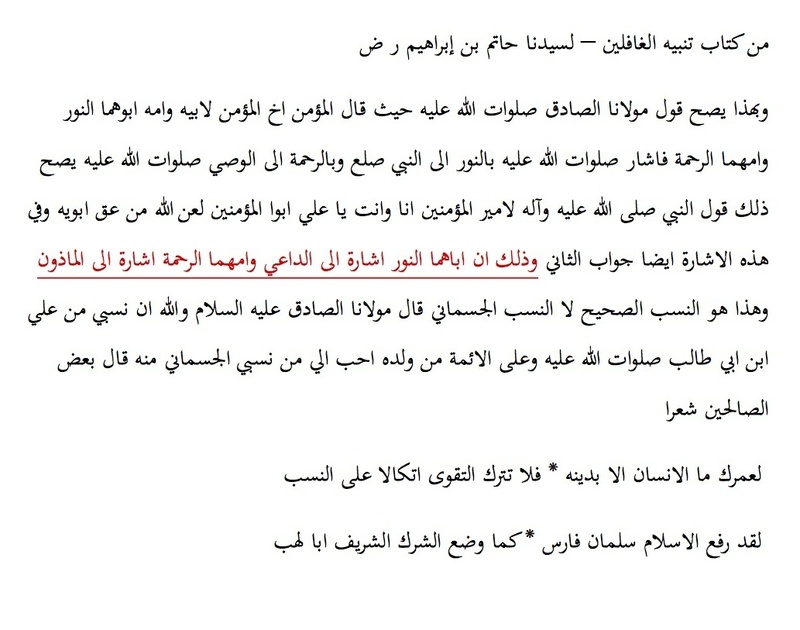 There is also a second meaning inherent in the Imam’s words: “Their father is noor” refers to the Dai, and “their mother is mercy” refers to the Mazoon. This is the true lineage (nasab), beyond the physical lineage of this world. Imam Ja’far-ul-Sadiq said: “By God, my spiritual lineage from Ali ibn Abi Talib is dearer to me than my physical lineage from him. 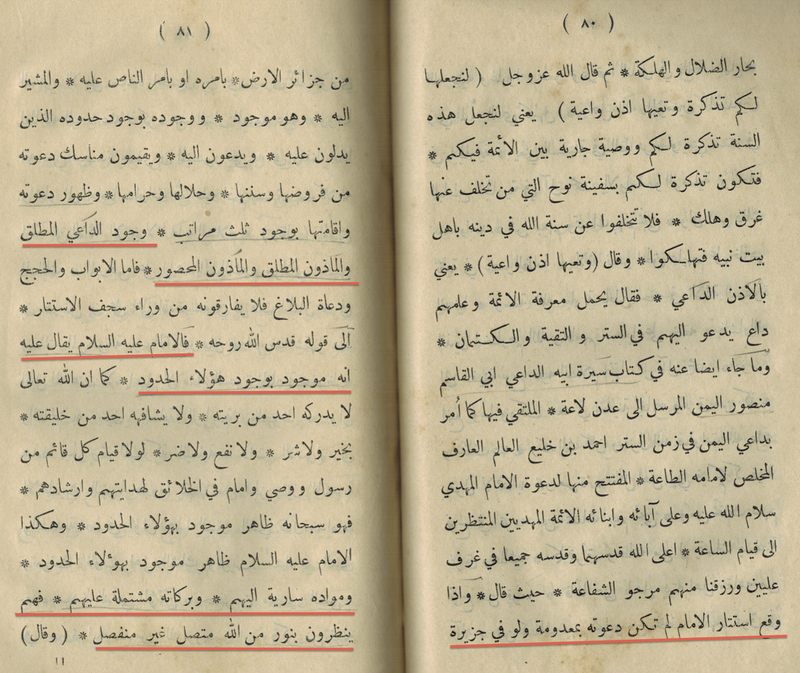 Sayyidna Hatim states that the Dai and Mazoon are mumineen’s ruhani father and mother. He further indicates that the Dai is noor and the Mazoon is rehmat. He states that this spiritual parentage is similar to the spiritual parentage of Mohammad and Ali. He states that this spiritual parentage is the true lineage (nasab), the only one that will count in akhirat. He pronounces la’nat on the “walad-e-‘aaqq”, i.e., the “son” who causes distress to his parents. Moreover, the religion of God’s tawheed is established by 3 rutbas: Nabi, Wasi and Imam (God’s salawaat upon them), like the three letters of the shahadat [A-L-H]. Moreover, each Prophet, in his age, and each Wasi and Imam, have 4 hudood [subordinate to them]: Baab, Hujjat, Dai and Mazoon, like the 4 words of the shahadat [la-ilaha-illa-llah]. This bayaan indicates the exalted position of the Mazoon, by counting him among the 4 rutbas which are signified by the four words of the kalimat-ush-shahadat [la-ilaha-illa-llah]. It also indicates that the Mazoon is among the rutbas who serve the Imam in establishing the religion of God’s tawheed. It also indicates that the Mazoon is one of the four essential rutbas of the Imam. It also connects the Mazoon intrinsically with the Dai. It also indicates that the ma’rifat of the hudood signified in the kalimat-ush-shahadat is essential to being a true mumin. The Dai and Mazoon are part the five daily compulsory faraz namaz prayers. Belief in them and accepting them in the time of Imam’s satar is as essential as praying the five daily namaz. Allah’s hudood are ten in number. Five of these are in the physical world, and they recurrently appear in every age, just like the recurrence of letters in the Bismillah, five fingers in humans, and five prayers in each day and night. These are the five hudood who recur in every age. They are the Imam, Baab, Hujjat, Dai and Mazoon. Their recurrence [and replacement] happens in the following manner: If an Imam passes away, another Imam arises in his place. If a Baab passes, another Baab arises in his place. If a Hujjat passes, another is appointed in his place. If a Dai passes, he appoints another to take his place. If a Mazoon passes, he appoints another Mazoon to take his place and fill his station. This bayaan indicates the exalted position of the Mazoon, by counting him among the five hudood who recur in every age. It also indicates the Mazoon’s exalted position, by equating him (as part of the five recurring hudood) with the five daily namaaz prayers, and the letters of the Bismillah. It also depicts the Mazoon as essential to Allah taala’s Dawat-ul-haqq. It also connects the Mazoon intrinsically with the Dai, and with the Imam. 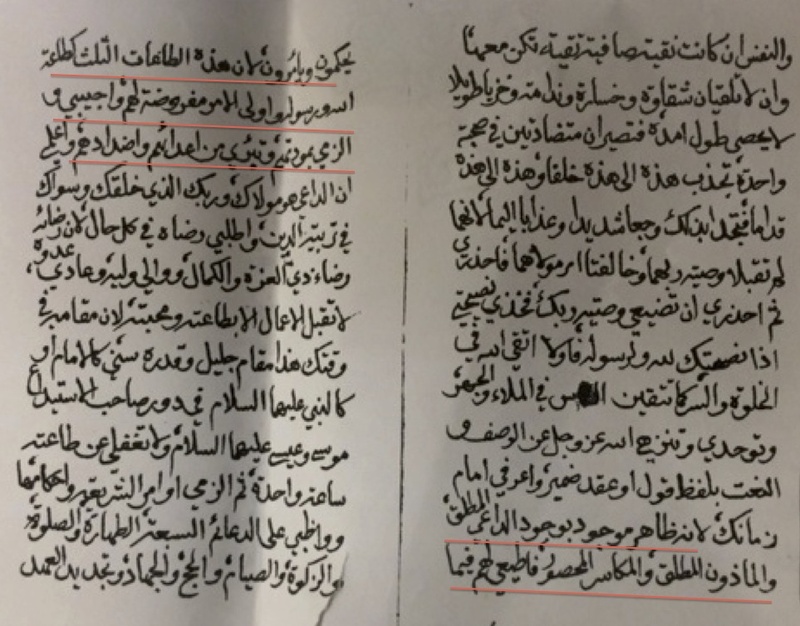 It also mentions that the Mazoon has the duty and authority to train and appoint his subordinate, a practice that has not been active in recent times, but theoretically it is possible: there is at least one precedent in Yemen of the Mazoon appointing his “tali,” with the Dai’s raza. In light of this assertion, it is clear that Syedna Taher Saifuddin’s well known statement for Syedna Qutbuddin ‘Khuzaima ni doa mustajab che’ has a deep meaning. Yesterday I did bayan that one my children is ill, [I prayed for him] khuda shifa aapay, so [the matter was] that in Dohad bhai Khuzaima had fever  degrees, and he did araz that ‘I will go for waaz’, I gave raza, that go, Allah will give shifa, he went for waaz, did bayaan for two hours, we also received telegrams that he did bayan with great shaan, and the fever went down. [My] doa is mustajab. Mamluku aale Muhammad, Imam’s Dai, My doa is mustajab, May Allah keep continue always that barakaat. I sent bhai Khuzaima to Dohad, he became ill with fever, but [remained] resolute (himmat). A father’s heart would soften…I did not do that [stop him from waaz], I sustained his resolve (himmat). A phone came [from Dohad seeking raza], [we said] do khidmat as much as you can. He did waaz for two hours. And when he returned in the evening the fever had subsided. Mamluku aale Muhammad, Imam uz Zaman’s Dai’s doa khuda mustajab karay che. A photo taken in 1382H at the instruction of Syedna Taher Saifuddin in Surat. Syedna Burhanuddin was at that time Syedna Taher Saifuddin’s Mazoon and his Mansoos, and he had hosted at his residence in Devdi Mubarak a ziyafat for Syedna Taher Saifuddin. The photographer, Shaikh Alihusain Lakdawala, photographed Syedna Taher Saifuddin with Syedna Mohammed Burhanuddin standing beside him. Then Syedna Taher Saifuddin instructed Shaikh Alihusain to find Shehzada Khuzaima Bhaisaheb and summon him, and waited almost ten minutes until he was located. When Shehzada Khuzaima Bhaisaheb arrived, Syedna Taher Saifuddin directed Syedna Mohammed Burhanuddin to stand at his right, and Shehzada Khuzaima Bhaisaheb to stand at his left, and told Shaikh Alihusain to take a second photograph. 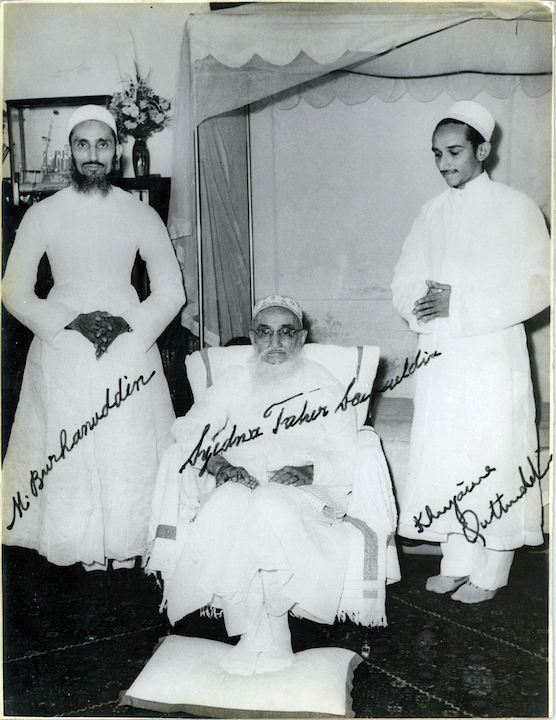 The Photo here is a copy of the autographed version –signed by Syedna Taher Saifuddin, Syedna Burhanuddin and Syedna Qutbuddin. Syedna Taher Saifuddin could have called any (or any number) of his Shehzadas. He did not. He called Syedna Qutbuddin. The occasion was Syedna Burhanuddin’s ziafat. Syedna Taher Saifuddin by calling Syedna Qutbuddin and waiting ten minutes for him to come made it clear that this was a conscious effort to show that Syedna Burhanuddin and Syedna Qutbuddin were special. Both were destined to become Dai. 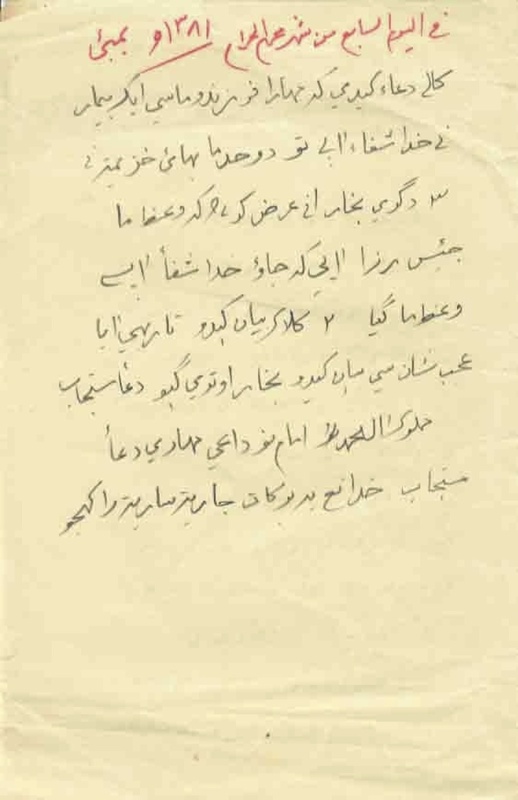 Note written by Shehzada Muhammad-ul-Baqir bhaisaheb Jamaluddin, addressed to Syedna Qutbuddin, accompanying a gift to him on his salgirah, 29 Rabi’al-Akhar 1398H . 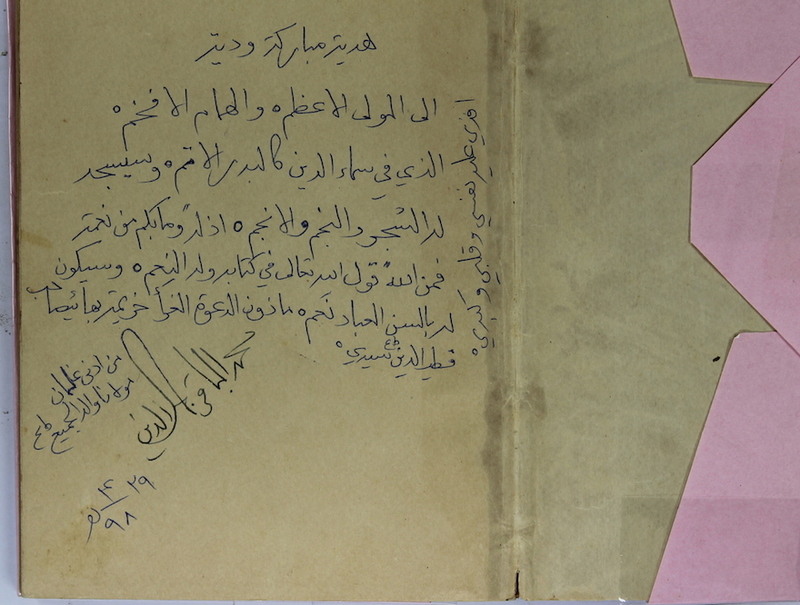 The gift was a manuscript of kitab al-Azhar. The dedication page is bound to the kitaab and is signed by Shehazad Mohammed-ul-Baqir bhaisaheb. Syedna Qutbuddin is the ‘greatest maula’. People will say na’am to him in misaaq because of the ‘alaamat wa ma bikum min ni’matin fa minAllah – verse 53 in surat al-Nahl, given to Syedna Qutbuddin by Syedna Taher Saifuddin. People will bow down in sajda to Syedna Qutbuddin – also because of the aforementioned ‘alaamah. The note says: To the greatest Maula and grandest patrician, who shines in the firmament of religion like the full moon, for whom trees and plants and stars bow down in sajda. For he has been given [the signature-alaamat by Sayyidna Taher Saifuddin RA]: <All your blessings come from Allah> Quran Nahl 16:53). These are Allah ta’ala’s words in His Book: All His blessings (ni’am) will be bestowed on him. The tongues of all God’s servants will say to him “Yes!” (na’am=I give you my bay’at). He is Mazoon al-Dawat-al-Gharra’, Khuzaima bhaisaheb Qutbuddin TUS, my lord (sayyid). My soul, my heart, my liver are all fida upon him. One of many madehs written by Miyasaheb Sh. 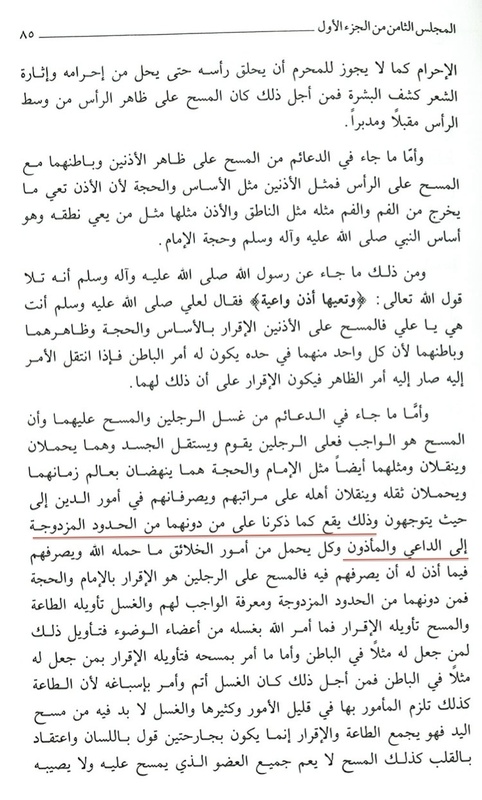 Ibrahim Yamani in praise of Syedna Qutbuddin. Sh. 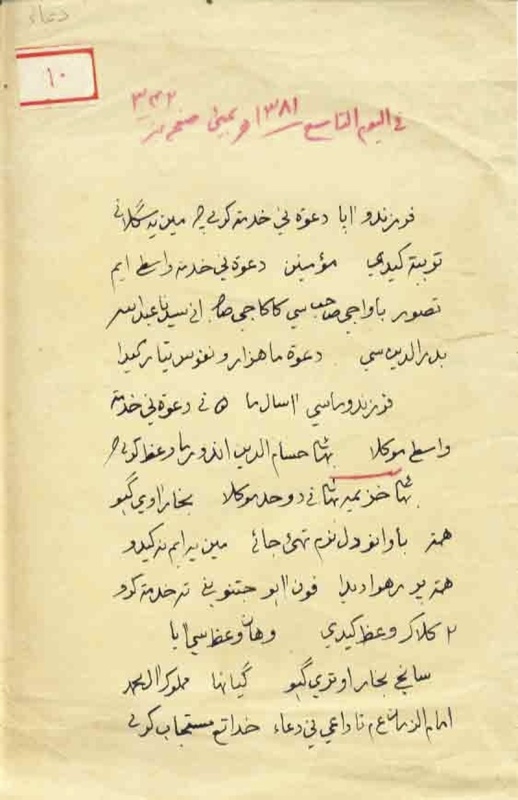 Ibrahim Yamani was Syedna Taher Saifuddin’s diwan for over 50 years and has written many madehs in shaan of Syedna Taher Saifuddin and Syedna Burhanuddin. 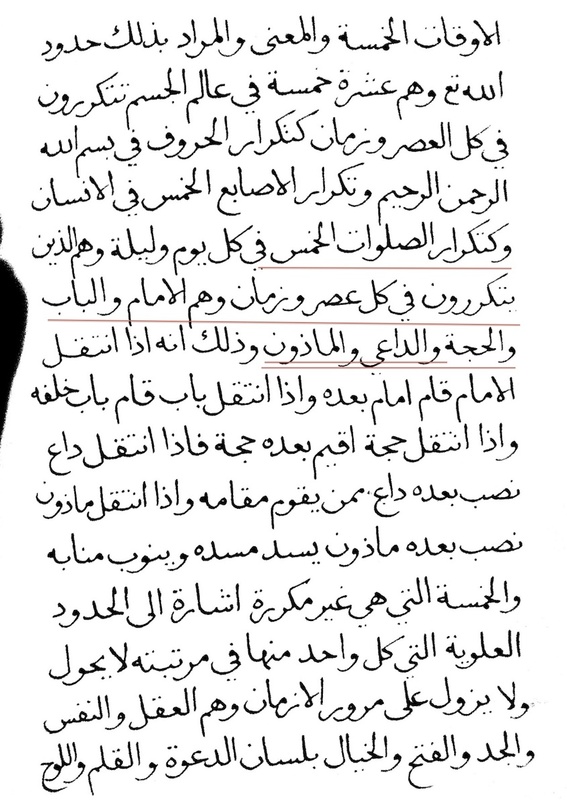 This particular madeh was written on a trip on which he accompanied Syedna Qutbuddin to Indore. Sh. Ibrahim continuously refers to Syedna Qutbuddin as his Maula and himself as his Ghulam. The language and adjectives Sh. Ibrahim uses to praise Syedna Qutbuddin is befitting of Mazoon and Mansoos. Towering high is his nobility and strong in resolve (himmat). That your karam and belovelence are with you ghulam Yamani. Miyasaheb Sh. Ibrahim Yamani praises and describes Syedna Qutbuddin in a manner that one would describe a Dai. He calls him Maula, over and over, and himself his ghulaam (servant). He acknowledge his divine virtues using the word qudsi several times. He describes him as having the essence of his father Syedna Taher Saifuddin. He describes him as the greatest pillar of Imam’s Dawat.